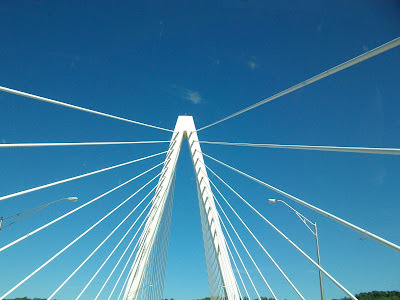 I was surprised to see this new bridge when I went to the dentist in Pomeroy, OH. by Beth Sergent5 months ago 535 views 0 3 MARIETTA — Though Ohio Gov. Ted Strickland ceremoniously passed over ownership of the Bridge of Honor in March to West Virginia Gov. Joe Manchin, III, technically, all the paperwork has not been done and the bridge still belongs to Ohio. Dave Rose, public information officer for the Ohio Department of Transportation District 10, confirmed the bridge’s ownership has not been technically passed from the Buckeye State to the Mountain State. Rose said Monday he was still researching what actually has to happen in order for that to occur and when it might happen. Rose did say though the bridge is complete, workers with ODOT were doing a final walk through last week and noticed a few mior repairs needed such as a dented lightpole. Rose also said the lastest cost estimate on the bridge is $65,264,499. The original estimate for the Bridge of Honor was $45.8 million ($3 million under the estimate) but over 118 change orders later and that price ended up at $65 million. The original contract to build the bridge was signed April 24, 2003 with the original completion date being Aug. 31, 2006. The majority of the increase over the years came from the slip on the Ohio side which required a major redesign, according to Rose. The Bridge of Honor ended up opening to traffic on Dec. 30, 2008. Nearly six years in the making, ODOT managed the project while CJ Mahan Construction Company of Grove City in a joint venture with National Engineering and Contracting Company from Strongsville worked on constructing the bridge which saw its fair share challenges that at times seemed stranger than fiction, though all were met in the end. There was the slip on the Ohio side which required additional engineering and support; the substandard concrete on the West Virginia tower ultimately had to be dismantled and poured again; a layer of shale was found on the hillside above the Ohio approach requiring additional excavation work near the bridge’s retaining wall; and unforeseen equipment delays resulted in no work being done on the bridge’s span for nine months. Other facts about the Bridge of Honor include: The aviation lights on the top of each tower are in different United States aerospace regions. The red light on the West Virginia side is in the Washington, DC aerospace region while the light on the Ohio side is in the St. Louis, MO aerospace region. In addition, the piers go 90 feet below the river surface with the top of the tower being 248.5 feet above the water and 168 feet above the roadway. There were 120 miles of cable used on the structure as well as 16 miles of longitudinal deck tendons and 6.9 million pounds of rebar. The tubes which house the cable have spirals on their exteriors to combat ice and wind. Inside these tubes may be as many as 27, 31 and 61 strands of 5/8-inch cable with the larger amount of cable being placed towards the center of the bridge. The width of the new bridge is 74.08 feet, compared to the width of the old Pomeroy Mason Bridge which has a 20-foot span from curb to curb. 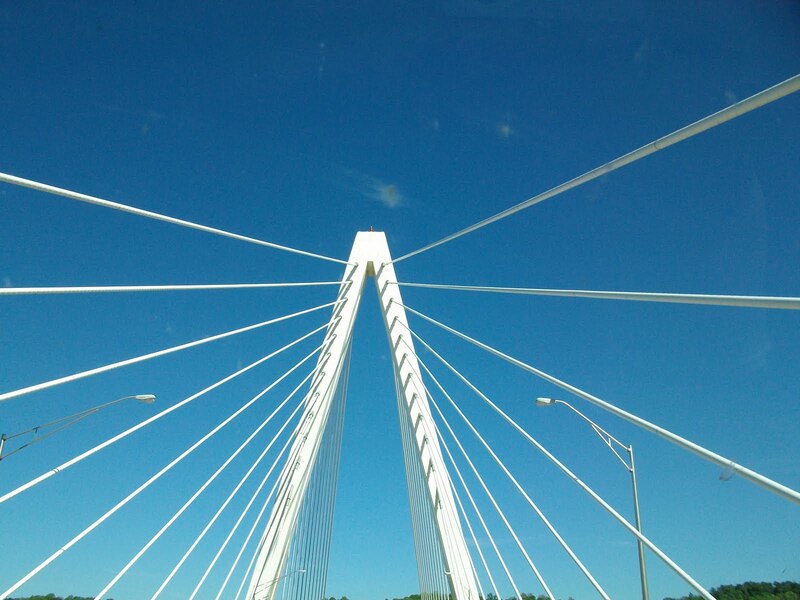 The new bridge is 1,852.51 feet long while the existing bridge is 1,847.75 long. The Bridge of Honor also required more than 15,000 cubic yards of concrete which is enough concrete to fill four Olympic size pools.